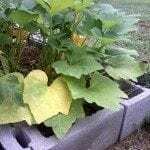 I have a few yellow squash plants with beautiful leaves and plenty of flowers. The problem is the flowers fall off before they produce any vegetable. What am I doing wrong, or what can I use or do?